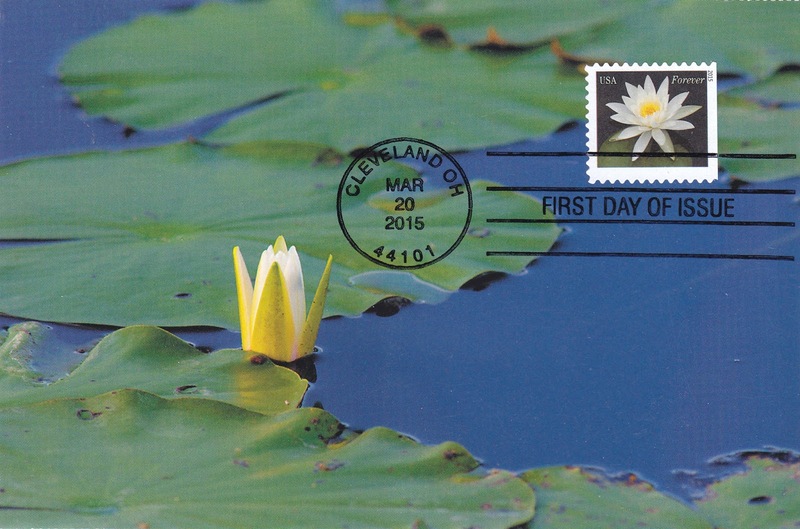 Postcard US-4015954 to Canada shows a maxi card with a Water Lilies first-class forever stamp issued by USPS in Cleveland, OH on March 20, 2015, and a first-day-of-issue postmark. The card was produced by SFWMD. 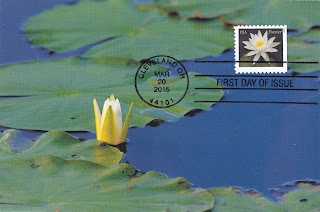 It reads on the back: "Lovely fragrant white water lilies are abundant throughout much of southern Florida's ecosystem. The floating aquatic plant provides fish habitat and aquatic wildlife food and cover, and stabilizes sediments. 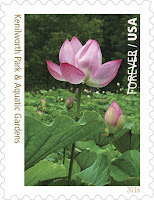 The Water Lilies stamps, priced at 49 cents at the time of issuance and valued at 47 cents now, have four designs based on existing photos taken by Cindy Dyer of Alexandria, VA in midsummer at the Kenil­worth Park and Aquatic Gardens in Washington, DC. Cindy Dyer is also the photographer of a Sacred Lotus (Nelumbo nucifera) image, taken at the Kenil­worth Park and Aquatic Gardens, that was used to produce the 11th of 16 stamps in the National Park Service’s Centennial stamp series. Sacred Lotus (Nelumbo nucifera), with its blooming period from late June to early September, can grow a bloom in the size of a basketball. I used to have some confusions between water lily and lotus. The Pond Plant Girl has an excellent article to describe their difference. Meanwhile, Duanwu Festival 2016 happens today. Eating Zongzi, rice balls wrapped in reed leaves or lotus leaves, is one of the traditions during the festival. One of the most popular ancient Chinese poems about lotus was Ode to the Lotus Flower (爱莲说) by Dunyi Zhou (周敦頤) (1017-1073). Duanyi wrote: "I just love lotus because she grows in mud, yet never contaminates with it. She floats on waving water, yet never dances with it." (出淤泥而不染 濯清涟而不妖) In this metaphor, the lotus flower represents someone who remains ethical and noble in spite of general corruptions.